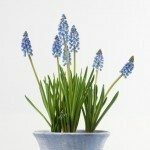 I never planted them, but I now have an extensive crop of grape hyacinths. I don't mind, however, in one of the gardens, they grow long and limp leaves that lie down in a tangle. I gave them a trim, but I'd rather have them stand up by themselves. I'm guessing some lack in my soil, but I don't know what it might be.